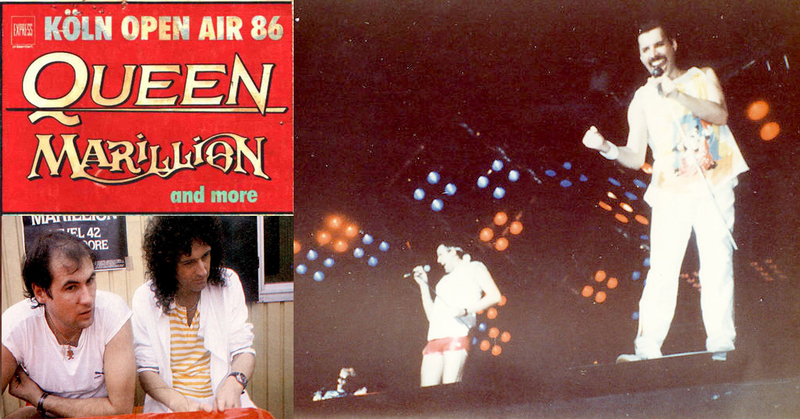 Both Queen and Marillion played this open air festival over 32 years ago. It was broadcast live on the German radio station “SWR 3.” As a result, this would be one of Queen’s most bootlegged shows. Brian May from Queen joins Marillion for Let’s Twist Again. Fish from Marillion joins Queen for Tutti Frutti. Only few seconds of concert footage have been seen – an aerial shot, and Freddie kicking a ball into the audience. It’s currently unknown precisely how much footage exists from this show. The majority of the concert photos were taken by Christian Wißing. Pre-show photo of Brian May with Fish was taken by Reinhard Harms.